Chronicle - A Survey of East Coker Churchyard, Somerset. 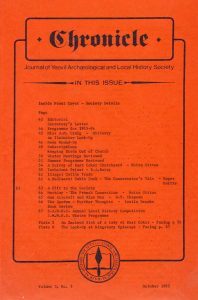 During the summer term of 1985, a group of children from Class 7F, East Coker Primary School, recorded the churchyard of St. Michael’s Church, East Coker. The group copied the inscriptions and recorded the dimensions, type and material of each of the monuments. A sketch map of the churchyard was drawn and each monument assigned a. number. The children went on to do a certain amount of analysis work on the information collected. A summary of the results is given here. The value of this survey has been greatly increased by the discovery of an earlier record which has provided much additional information. The main part of the churchyard contains 61 numbered monuments, with a further four located in a detached family plot. It was in use up until the close of the 19th century, with the monuments spanning the range 1680 – 1892. The detached plot contains four monuments of the Walker Heneage family dated 1912, 1937, 1947 and 1950. These monuments all follow a similar pattern of a kerbstone with a cross mounted on a stepped plinth at the head. The inscription is cut on the plinth. The earliest of this group,(No. 65), is an elaborate and expensive monument of marble, inlaid with coloured marble, by Farmer and Brindley. The other three are of the same design but in a plain white limestone. Only the 1947 memorial to Dorothy Walker Heneage (No. 63) bears a maker’s name, Appleby and Giles. The monuments of the churchyard proper comprise 37 headstones, 13 table tombs, 4 coffin slabs, 3 ledger slabs with surrounding railings, a few miscellaneous items and a standing cross. A loose inscription lying on a chamfered slab (nos. 11 and 12) probably represent a fourteenth altar tomb. One area of the churchyard has been cleared in order to lay out a car park. Some 6 loose slabs propped against the west and south churchyard walls probably come from this area. The earlier survey indicates that this was the case. In relatively recent times undergrowth on the eastern side has engulfed several monuments, otherwise the churchyard seems undisturbed. In this way we have gained the names of a further 29 people. The specified ages of the persons commemorated range from 1 month in the case of Elizabeth Ann Groves (No. 28) to the 91 years of Mary Harrison. The average age at death for a woman was just short of 50 years, while for a man the comparable figure was very close to 54 years. Amongst the females there were four deaths in the 20 – 35 year old group while there is only one such amongst the men. It is obviously dangerous to draw conclusions from such small numbers, which may only reflect a normal statistical scatter, but some deaths in childbirth might be expected. A small number of children are represented, three under one year of age, two at four years and one at five. Thirteen people outlived their ‘three score years and ten’, six of these were women with the oldest person being, Mary the wife of William, Harrison, who died in 1898, aged 91 (No. 7). These figures make an interesting comparison with those gained from the study of the churchyard at Wharram Percy in the East Riding of Yorkshire. Wharram had a much smaller churchyard with only 31 monuments, spanning the range 1770 -1906. During that time, the average age at death (males and females taken together) was 46. The comparable figure for East Coker was 51.4, but at Wharram ten people lived to over 70 perhaps reflecting that the harder life in the much poorer and exposed Yorkshire parish meant that those who did survive into old age were then more likely to live on. “…HENRY MICHELL. ROYAL NAVY / BORN 1830 DIED 1853″ and ” … JOHN BULLOCK MICHELL / COMMANDER ROYAL NAVY / BORN FEB – 1829 DIED SEPT 8 1868″. No other relatives were commemorated in this way. There were 29 of these monuments – half the total number of stones. This trend was also found at Wharram. The period spanned by the legible monuments is 1680 – 1898. However the date 1898 was the second entry on a headstone whose first date was 1870 – a more likely date for the erection of the2 stone. The main sequence of burials seems to end in the 1870’s. Late in the last century the churchyard was closed and a cemetery opened up elsewhere. The earliest date now legible is 1680 but the earlier survey gave the date of the George Dashwood monument (No. 24) as 1657. The stone is recognisable although the date is no longer distinct. The table tombs date between 1673 and 1831. All were made from Ham stone with the exception of the monument to Joanna Helyer, 1767 (No. 60), where the tomb chest was constructed from lias with the table top slab being Ham. The coffin stones range from 1837 to 1871 and are of a homogeneous white limestone except for one anonymous body stone of disintegrating lias. An even shorter lived fashion was for a horizontal ledger slab bearing the inscription, surrounded by an iron railing, chain or hearse. These three stones are all dated during the eight years from 1864 – 1872. By far the most popular type of monument was the headstone, exam k- spanned pies of which spanned the period under discussion. More than half of them (21) are of Ham stone, 11 are of a fine-grained white limestone, while three are of lias. One of these still bears a date – 1730 – and is the only lias monument to retain a date. The limestone headstones started in 1847 and continued unchallenged to the end of the sequence. It is, therefore, of significance to note that the Ham stone was used exclusively until the appearance of the 1730 lias stone and disappeared almost totally after 1840. My children and My Friends. When all things have an end”. John Cox, 1777 (No. 50). And ease me of my pain”. Mention has already been made of an earlier survey of the churchyard, a typed copy of which is held by the church. The record was copied by the Rev. Bailey in 1923 from a manuscript either compiled by or in the possession of Miss E. Troyte-Bullock of Naish Priory. The record itself is undated but the latest date given is 1901 (on an internal monument). Thus the record is between 62 and 84 years old. In that time considerable changes have taken place, notably the clearance of the car park. Many of the stones were a good deal more legible at the time and a full 25 of the stones listed are either no longer reconcilable with the existing monu-ments or are lost altogether. There were seven monuments recorded in the present survey which could not be traced in the earlier record, leaving a discrepancy of up to 30 memorials. Where the monuments still exist and are fully legible, the record is usually fairly accurate but discrepancies do occur, perhaps as a result of typing errors in the transcription. It is, therefore, unwise to rely on details which can no longer be checked. In many cases the verses or texts nave been omitted. However, the existence of this earlier record has facilitated tree recognition of many badly eroded stones and provided very useful comparative material. Thus far emphasis has been placed on monuments designed for the churchyard, however, No. 14 would have originally been placed inside the church and moved outside at a later restoration. It is an incised slab of late 13th century date. The monument comprises a coffin shaped slab of Ham stone, sawn longitudinally in half, resting on a Ham stone coffin. 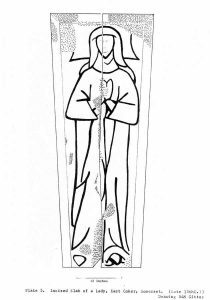 The slab bears the incised image of a lady in widow’s garb, her head resting on a pillow. There is neither animal nor bracket depicted at the foot – a feature which supports a late 13th century date. (See Plate 5). The dismemberment of the slab may have occurred to facilitate its re-use as building material. It may even have been discovered when the mediaeval tower was dismantled in the 1790’s 3 The slab has a deep chamfer on both sides and at the head but the chamfer at. the foot has been lost, effectively shortening the slab by some two to three inches. 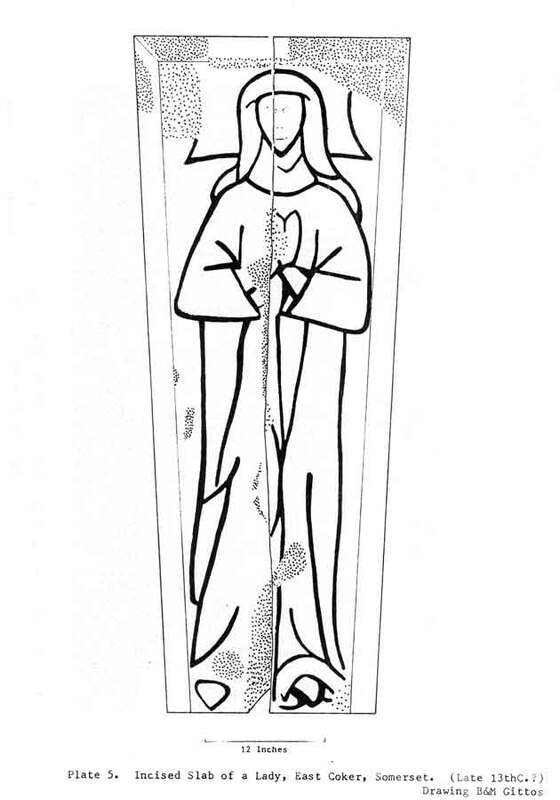 The original dimensions would have been very similar to those of the coffin and it is possible that the two do in fact belong together. This slab is at present the only known use of Ham stone for an incised slab. No attempt can be made here to publish the survey in full but a copy will be held by East Coker Church. The survey and analysis were conducted by Kate Compton, Simon Cox, Helen Gittos, Howard Legg, Steven Palmer, Jill Quirk, Ian Robins and Gemara Whear. The exercise was directed and this summary compiled by Moira Gittos. 1. Rahtz, Philip and Watts, Lorna. 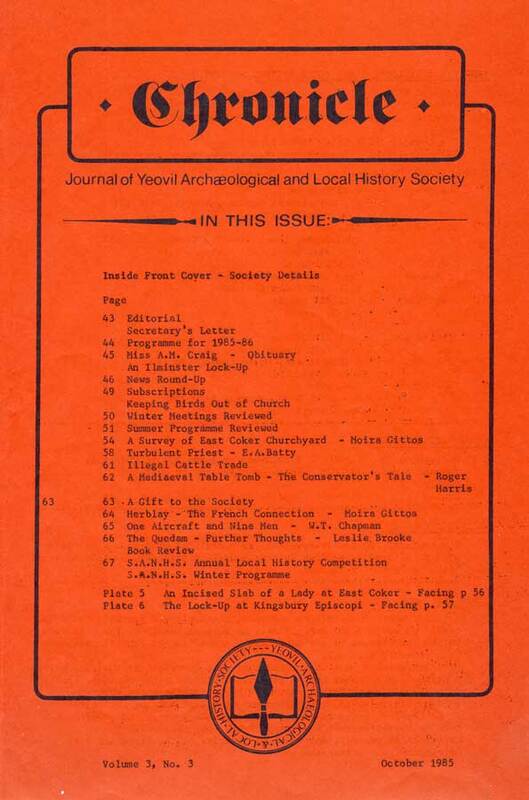 Wharram Percy – The Memorial Stones of the Churchyard, York University Archaeological Publications, 1, 1983. 2. I am grateful to the Rev. Hunt for confirmation of the closure of the churchyard at this date. 3. In 1791, a petition was presented to the bishop, on behalf of the parishioners, for permission to demolish the tower which was said to be in a “ruinous condition”. I am indebted to the Rev. Hunt for this information. Appendix. List of Surnames commemmorated in East Coker Church and with Dates. Barrett 1760x, 1779x, 1780, 1874, 1898. 1792, 1794, 1808, Highmore 1824, 1840. Brewer 1777. or Hiller 1683, 1730, 1730. Butcher x 1858x. Hooper 1871. Chapman 1865, 1868. Hull 1868, 1877. Cooke 1673, 1682x. Hurst 1867. Cox 17(6)3, 1777, 1784, Huyshe 1863x, 1871. Dodge 1703x, 1708. Michell 1853, 1869. Farley x 1708x, 1755. Neal 1792. Fuller 1705. Richards 1700, 1714. Gill 1872. Sion or Stone x 1712, 1712x. Goodman 17(5/3)1x. Tasut or Tabut x 1698. Groves 184(2)1x, 1843. Trask 1785x, 1815. 1847, 1849. Walker Heneage 1939, 1947, 1950. Gyles, Giles 1671x, 1708x, 1711. Young 1722.
x Denotes a name or date supported by the earlier survey but not now legible.